Love to take your horse with you when you're traveling? Winding River Resort is the perfect location for a horseback riding vacation. With your own horse, you have direct access to miles of designated trails in adjacent Rocky Mountain National Park or trailer your horses to more distant trail heads. You can even take a day trail ride through Rocky Mountain National Park over the Continental Divide to Estes Park, Colorado. 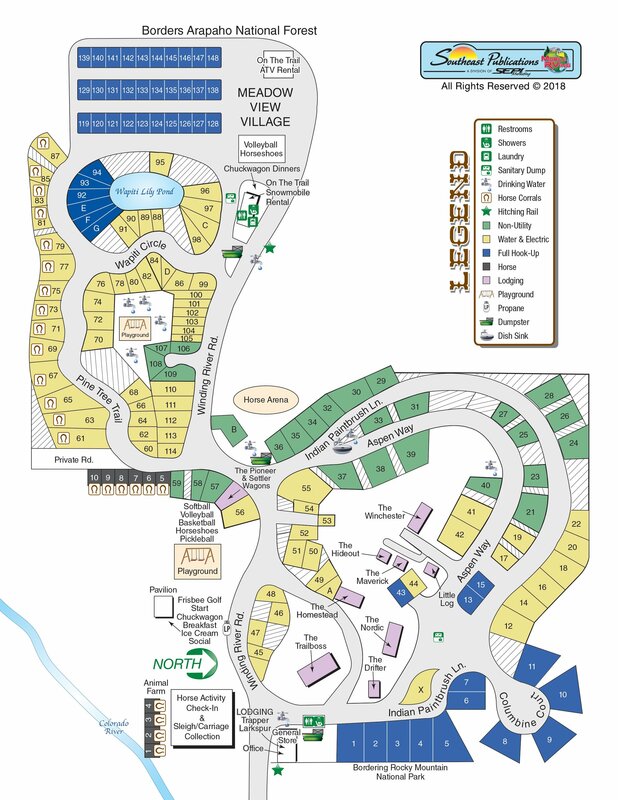 At Winding River Resort you can set up your own camp or stay in our lodge rooms and cabins. Horse runs are available on your campsite or at the barn. Barn runs are 16 X 24 and site runs are 16 x 32, large enough for two horses. The cost is $15 per run (one horse), $25 per covered run (one horse) and $5 for each additional horse. A maximum of two horses per run. Owners of horses staying at Winding River Resort must be a registered guest at Winding River Resort. I certify that I am the legal owner of the horse or horses in my possession at Winding River Resort.I agree to release and discharge Winding River Resort, its owner, and employees from all future claims arising from personal injury, horse injury, death, or property damage. All horses must be kept in designated pens assigned by Winding River Resort.No picket lines allowed.Tying to horse trailers allowed only for tacking of horses. All horses must be kept off regular campsites. Horses are not allowed to graze outside of the pen on the campsite or anywhere else on Winding River Resort property. All horses must have current health certificates (within 30 days) and Coggins tests (within 1 year).No exceptions to Colorado residents. No stallions are allowed at Winding River Resort. No untrained horses are allowed at Winding River Resort, this is not a training facility. Each horse owner must provide and feed his/her own horse.Rocky Mountain National Park requires certified weed-free hay to be fed 48 hours prior to your arrival and during your stay. Any panel damage will result in a fee of $150 per panel. Each horse owner is responsible for the daily cleaning of pens and campsites. At check out, the pens and campsites must be free of manure, hay, straw, and all bedding or a cleaning fee of $50/hour will be charged to the bill. Bring your own manure forks, rakes, and muck buckets to clean your pen.Winding River Resort will provide a manure spreader. Dogs are not allowed in Rocky Mountain National Park.Dogs cannot be left unattended at Winding River Resort i.e. tied to a tree or left in a trailer. Use of Winding River Resort’s gooseneck trailer will require a signed contract. Check in and check out for horse runs is 12 p.m. Riding trails may be subject to closure due to various conditions such as weather, maintenance, and safety concerns.For complete and up to date trail information contact Rocky Mountain National Park at 970-627-3471 and Arapaho Forest at 970-887-4100. Barns runs cannot be split for 2 horses.